Tourist village of RTDC is located in the town, just opposite to the fair ground.The hotel is beautifully appointed & offer AC and non AC cottages & tents. Tents are available during Pushkar Fair. The cottages are well furnished & tastefully decorated, offering amenities such as attached bathroom toiletries. The cottages are built just like a village but with permanent structure. Travel Desk, Laundry, Car Rental, Shopping arcade and Rajasthani Cultural evening are some of the other facilities that are available a Tourist Village during the fair. 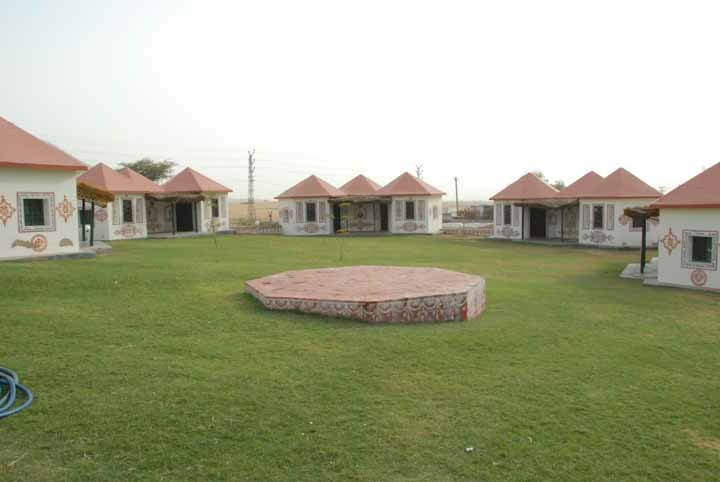 Air Conditioned cottages & tents with attached Toilets with running Hot & Cold Water & Colour Television facility available in each cottages & tents. Tourist village in Pushkar has a multi cuisine restaurant which serves delicious Continental, Indian and typical Rajasthani cuisine. The delectable taste of the food and the atmosphere makes it special for the guests. The hotel is beautifully appointed & offer AC and non AC cottages & tents. If you have not decided yet or wants to customize tour itinerary or hotels listed above in "3 Star Hotel Tourist Village Package in Pushkar from Rajasthan Tourism Rs.900/-", then we can change the travel itinerary and make a personalized, tailor-made holiday package, especially for you. We can modify this travel package as per your itinerary, budget, duration and the tourist places you would like to visit, including transportation and airfare should be included or not. Please fill the form below to contact us.